Review Summary: SHAAPIT is truly a scary movie which comes across as a worthy follow up to RAAZ and 1920. Post Raaz and 1920, you expect an enthralling horror film, with chills aplenty from Vikram Bhatt. What happened? After the genuinely scary 1920, producer-writer-director Vikram Bhatt is back to making below-par pictures. 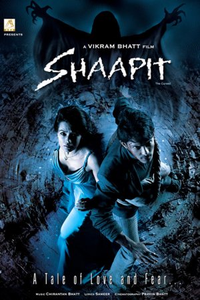 SHAAPIT is truly a scary movie which comes across as a worthy follow up to RAAZ and 1920. Overall, this is certainly not going to be a Hat trick for Vikram Bhatt and it’s time RGV and him get out of horror genre and try something else as this is its getting repetitive. Shaapit is certainly worth a watch. Vikram Bhatt's third horror outing is one of his best. Post 1920 Vikram Bhat comes with a teen soap opera titled 'Shaapit', no thrill, not a single scary scene, and wooden acting with two new pretty faces. There are some genuinely frightening scenes that will make you jump off your seat. Those looking for chills won't be disappointed. The recent spook-fest in Bollywood proves that the genre is back in business. Vikram Bhatt is slowly but surely moving in to own this genre.